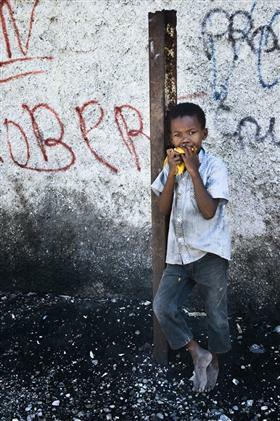 “Christina Simons visited Haiti in 2006 to work on a photo-essay about restaveks, children sold or given into a life of slavery, now known as The Haiti Project. She came to know people there; many of whom were directly affected by this latest turmoil. She knows also that Haitians are people of resilience and spirit and a rich and complex culture, despite all the adversity they face in their daily lives. Christina's photographs of Haiti hint at this strength of will in the people she encountered. They are also imbued with her compassion, which saw her direct proceeds from her 2007 exhibition back to the people she had photographed.